In Culture, Guides, Southeast Michigan. The hardest thing to do when writing about the murals of Detroit is deciding which ones to highlight. There is endless art to be seen in the streets of the city. 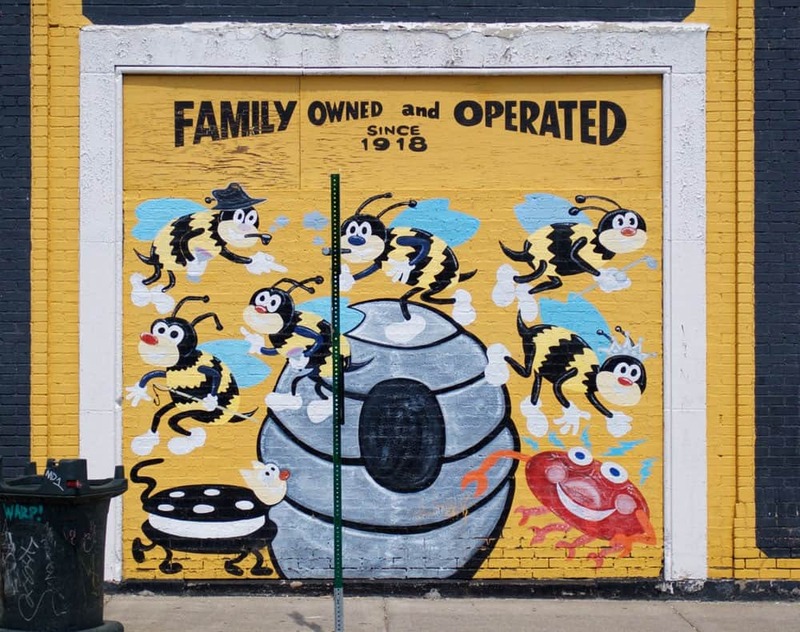 The resilient nature of this community is perfectly pictured by the splashes of color and design decorating every area from the heart of The Heidelberg Project to the bustling streets of downtown. Narrowing it down to just a few was a challenge but worth every pondering moment throughout my adventure. The first murals I wanted to hit were the Splash Murals. When you first see them it looks like someone dropped the most beautiful bucket of multi-colored paint from the roof of the building and it dripped down in one huge bright splash! They were painted in 2009 by artist Katie Craig. The first stands an impressive 9-stories tall. Of the works I am sharing, these were probably the most remote located at 7332 Oakland Street and 7327 Beaubien Street in Detroit. The Detroit Chimera Graffiti Mural Project is easily spotted from the highway, and it is a favorite of most visitors I know. This lion stands 5-stories tall at the Russell Industrial Center, painted by artist Kobie Solomon. The project was started in 2012 and is said to be the largest graffiti mural in the state of Michigan! Definitely a must see, and easy to do so without even leaving your vehicle thanks to its size and location. You can also see it up close at 1600 Clay Street in Detroit. Eastern Market is filled with tons of great art! If you want a chance to see a lot of different murals but only park once, this is the district to do it in. I had a hard time narrowing it down, there are plenty more options to be seen. 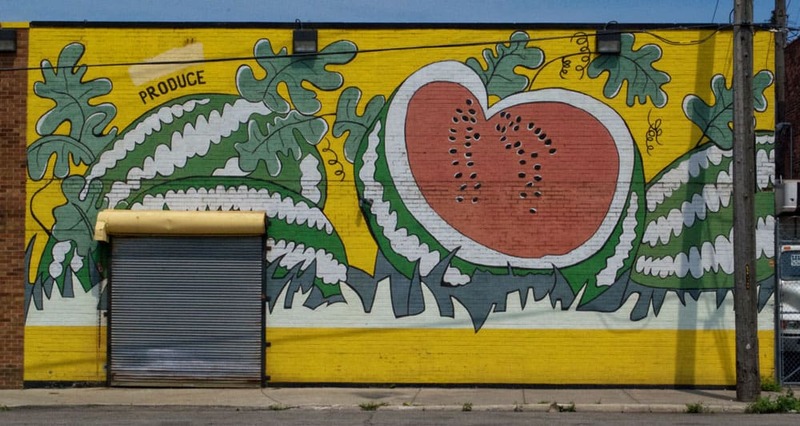 Featured here are Shark Toof, Eastern Market Cold Storage, Produce, and Busy Bee Hardware. They are all in walking distance from 2934 Russell Street in Detroit. One mural that I couldn’t help but share was the Welcome to Woodbridge giraffe. It is a bit further removed from the others, but still worth a detour if you’re a fan of the whimsical and childlike artwork. This was painted by the Summer in the City service organization and is located at the intersection of Trumball Street, MLK Jr. Boulevard, and Grand River Avenue. HopCat, located at 4265 Woodward Avenue, has some notable pieces that can be seen when stopping by to enjoy some Michigan brewed beer and Crack Fries. At the very least, they provide a beautiful distraction while waiting for an open table any time of year. If you are headed downtown there are a lot of stops you can make to see some gorgeous work. One suggestion is seeing The Belt, which is an alley that was converted into an outdoor gallery of sorts. With lights strung overhead and lots of seating options it is a great spot to have a short rest and see a lot of great art including pieces by artist Shepard Fairey. The Belt is located between the Z parking structures at 1208 Woodward Avenue. Speaking of Shepard Fairey, the artist best known for his work on the “Hope” Obama campaign, has been working in Detroit recently to create some pretty great works of art. The largest can be spotted downtown on the One Campus Martius building, which was completed in May of 2015. If you look around there are other works of Fairey’s sprinkled throughout the city. Lastly, the largest piece I am sharing today is the Whale Tower by artist Robert Wyland on the Broderick Tower. The newly renovated Broderick Tower has said that they will not be keeping up with the large-scale work of art and that it will fade naturally, so let that inspire you to go visit it as soon as possible! There are countless works of art that could be shared on this topic, but here are just a few to give you a taste of the street art currently free for everyone to see any time they please. Take advantage of these sunny summer days and go exploring to find your favorites. Of the street art in Detroit, which pieces do you love best? Are they on my list? If not, share with us so we can discover more in this beautiful city! Tagged art, Broderick Tower, Busy Bee Hardware, Detroit, Detroit Chimera Graffiti Mural Project, eastern market, Eastern Market Cold Storage, Hopcat, Katie Craig, mural, Produce, Shark Toof, Shepard Fairey, Southeast Michigan, Splash Murals, street art, Summer in the City, The Belt, Woodbridge, Z Lot. I'm a West Michigan girl born and raised. I currently reside near Grand Haven after a short but amazing time in Royal Oak on the Southeast side. I am an art teacher, blogger, adventurer, change agent, and an all-things-lovely enthusiast. I adore all of the happy things we get to enjoy here in Michigan like fresh flowers, summer sunshine, wearing warm sweaters, hot cups of spiced cider, and sweet cherries. The skies, trees, and waters of this state all have my heart. You can follow me on Twitter & Instagram @_tinypainter or at my lifestyle blog www.tinypainterblog.com!